Lots of cool stuff happening with our GCU artist community, so let’s get right into it! Our latest guest blogs: Doreen Erhardt’s regular column, A Dash of Inspiration – a Cup of Creativity brought us a link to her newest Squidoo lens which is all about floral photography for beginners (but pros will get a lot out of it, too). Tanya (Moonie) gave us a well researched and very informative post about photographing teddy bears and how copyright may affect your right to make greeting cards from your shots. Sheryl Kasper talked about how to fix a ho-hum flower photo and turn it into marketable gold. Sun at Night gave us a very informative article on photographing in public places, with some surprising do’s and don’ts as well as important resources for photographers. We had no newsletter last week, so let’s go on: Doreen’s latest A Dash of Inspiration – a Cup of Creativity brought us some places to go for photo card inspiration. The Inspiration Station followed that up with even more places to get inspired, including links to scrapbook templates. And finally, Peggy Mundell gave us a class in before and after photos, telling us how she turned so-so photos into commercially appealing shots. Until next time, don’t forget to pass the love around! With GCU’s announcement that a new tool for creating Photo Card templates has come on-line, many artists are scrambling to design cards for every category. At the moment, all cards will go into your private gallery to be released on September 1st, when the new tool goes live for customers. Now I know some of you already have Photo Card templates available at places like Zazzle, and like me, you find this an exciting development. Others are completely new to the concept, or perhaps aren’t as confident as the seasoned pros, so I want to address them here in my Top Five Tips for Designing Photo Cards. First, don’t panic. Whatever graphics editing program you use (Photoshop, PSP, Gimp, etc) you will find tutorials on-line for how to work with transparent layers and make .png files. Learn how to do that first, as this knowledge is paramount to successfully creating Photo Card templates. Second, study your market. Many on-line greeting card retailers offer Photo Cards these days. Go have a look at their offerings. Do your homework. Can you identify any trends? Third, do your best. Treat new Photo Card designs exactly the same as you would any other design: it MUST have commercial appeal, be well composed and have eye appeal. Shoppers are more discerning than ever, and there’s plenty of competition out there for their hard-earned dollars. In addition, new Marketability Standards have to be met. If you aren’t sure, feel free to submit a new design to the Critique Clinic, held on this blog every Friday-Saturday-Sunday. Fourth, find a niche. You know everybody’s going to be designing Photo Card templates for the super, ultra popular categories like Christmas. But there are many other opportunities for sales if you design Photo Card templates for less well represented categories. Study the categories list. Identify categories that have few or no cards, and make some to fit. Fifth, don’t be afraid to try something new. Shoppers tend to be a little more fickle when it comes to Photo Cards versus traditional greeting cards. They like what’s hot and new, so a Photo Card template that’s on the cutting edge one year may decrease in sales the next. Break out of a design rut by trying new ways to express your creativity. You may find that by staying on top of the trends, and offering new templates in a timely manner, you’ll see more sales. We’re having a new Lightning Round for our bloggers, and the subject is butterflies (inspired by the “butterflies in the stomach” currently experienced by many artists). The rules are simple: make a new blog post or a new Squidoo lens on the topic of butterflies. You can write about photographing butterflies, making scrapbook pages with butterflies, embroidering butterflies, drawing butterflies, collecting butterflies, creating a butterfly garden…in short, if it involves a butterfly of any kind, you’re good to go. Include links to 3 cards at GCU with a butterfly theme (any category). Give us a link to your blog post in the comments of this Newsletter post or send me an email. Deadline is August 22nd, and I will make a master post of links on August 23rd to be shared with all participants. And yep, there’s a prize! I’ll let the winner choose between a $25 gift certificate to Amazon, a $25 gift certificate to Starbucks, or $25 worth of free cards at GCU. How’s that for cool? So start flapping, folks, ’cause I’m getting butterflies just thinking about the great posts we’re going to see! The Critique Clinic is open every Friday, Saturday and Sunday to all GCU artists seeking peer review, advice and tips. Any artist may submit or leave a critique. All artists are encouraged to check the comment threads – you’ll learn something that may help you with your own marketability. 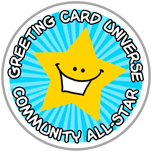 Greeting Card Universe continues to seek new opportunities to promote itself (and you, too). They’ve got a guest post on the History of Halloween at the A Frugal Life blog. Nice! There is a GCU artists’ group on Facebook? We encourage you to join, post cards for your fellow artists to admire, share news, and have fun! The Salon of Art Facebook fan page (by Doreen Erhardt) is a great place to go to find links to all kinds of helpful resources like tutorials, brushes, news about competitions and contests, marketing tips and a lot more. Check it out! Our own Peggy Mundell (DogBreedz) is in the running to join the Channel 10 San Diego A-List, but she needs your votes to get there. You can vote for her here. Locals will have the opportunity after voting to purchase a photo shoot for $80 ($150 value). Deadline’s August 27th, so get moving and get voting! If you have a question about one of your cards being “held” for review, or if your card has been declined due to the new Marketability Standards, write to cardreview@greetingcarduniverse.com and include the PID# of the card in question. DID YOU KNOW you can “like” this newsletter or any post on the GCU Community blog, or include them in your social bookmarks? Or Google +1 them! Just click the title of the post, which takes you to the permanent link page. At the bottom of the page you’ll see buttons for social sites like Facebook, Reddit, StumbleUpon, etc. Excellent as always!! Thank you Corrie! There is so much going on, pretty exciting. I wish I had time for every section. Corrie, there’s a typo on the next newsletter publishing date. What little t joined the club at the end of my name on the blogroll? lol This community newsletter and its core crew are the next best thing to sliced bread! No excuses to not know what’s going on. Thanks again from the Washington beach. I am loving the blog – so much great information and fun times, too! Thank you CORRIE! Thank you Corrie for all of your hard work in keeping us informed and for your helpful tips you give to us all of the time. I have done a Squidoo Lens about butterflies. I was happy to see this contest, as I LOVE butterflies. Sher, that is an awesome lens on butterflies, cute drawings!! Very well done!! I may create a lens too, or do a blog post, haven’t used Squidoo in forever! Thank you Cherie. I absolutely love butterflies. 🙂 It was fun to write about them. Yes, but that’s usually very quick and easy. Thanks Corrie! Always great to receive the email announcing a new newsletter! Worth the read! I agree with everyone’s comments … great job, as usual, Corrie! This blog has turned out to be a valuable resource. Thank you for the hard work you have put into it. Having done newsletters in the past, I know how much dedication and hard work goes into something like this, and how important it is to have people willing to help. I’m continually impressed by the number of talented artists who contribute stories, tips, inspiration, etc. each week. Always a great read! I agree, always a very informative and valuable resource, even with all the “butterflies in our stomachs” I feel we’ve been given a chance to spread our wings, learning how create new and improved designs/photos and so on… with the help of our fellow artists. Thank you Corrie and All! always a pleasure to read this blog. Although my butterflies have sort of calmed, I am also thinking this a chance to spread my wings and fly. What a great topic to blog about too. I added my blog post today about my thoughts on being around butterflies – and one encounter in particular. And thanks to all the guest bloggers who continue to inspire and share their expertise, talent and creativity with all of us. Kind Regards and Happy Creating to all! Great newsletter with lots of useful info, as usual. 🙂 Thanks! Thanks, Corrie and Nene, for another great contest with an inspiring theme! Here’s my entry. Reading the blogs tomorrow..I’ve glanced and they all look awesome! Great job everyone…here is mine.